How well do your employees understand your compensation plan and philosophy? Clearly communicating compensation to your employees is essential to long-term success but it can be complicated. 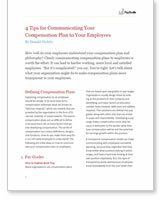 Simplify how you communicate your compensation plan in four steps that ensure transparency and make your job easier.